I remember thinking “I must make this dress!” when the pattern first came out. 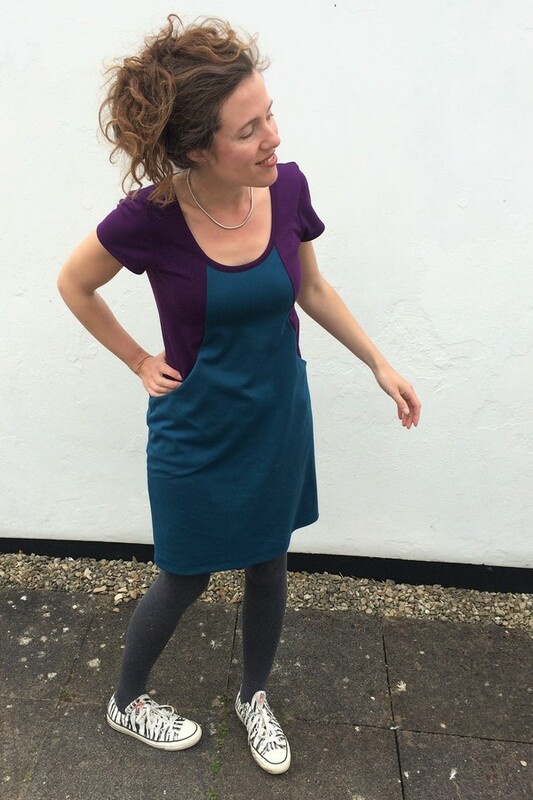 It had everything I was looking for in a knit dress: a fitted silhouette and big pockets, plus some interesting style lines to make it a bit different to the other knit dresses I’ve made. Took me a little while to get around to actually buying the pattern, but I’m glad I waited as I got it on sale and got to take advantage of all the online feedback about the pattern sizing. 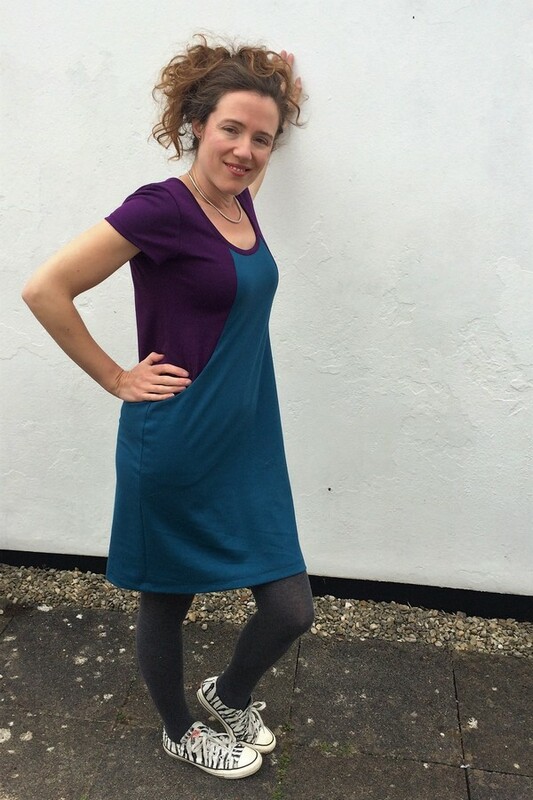 The Heather Dress by Sew Over It. It’s a princess seam dress designed for stable, medium-weight knits with options for three sleeve lengths. I made the short “capped” sleeves. My measurements put me at a 12 for the hips and between 10 and 12 for the bust, but I opted to cut a straight 10 based on the finished garment measurements (lots of ease at the hips!) and feedback from other sewists. sewed a smaller seam allowance (6mm) at the back to give myself a bit of extra breathing room at the bust, since there wasn’t any wearing ease here. Cut the neckline lower using the neckline from the Deer and Doe Plantain tee. This is my first time sewing a Sew Over It pattern, and I’m pleased to report the instructions were really easy to follow. I found myself laughing aloud at one point as the pocket started to come together. So clever and surprisingly simple! There were a couple of small changes I made while sewing, however. For some reason the pattern has you put the sleeves in last, but I much prefer sewing them in flat before doing the side seams, so that’s what I did here. I also had to make the hem smaller on the sleeves, as there was not enough fabric there at the underarm to take a 1.5cm seam allowance. I don’t consider these true cap sleeves either, and I think next time if I choose to make the short sleeves I will make proper cap sleeves that end halfway down the armscye. Time taken: 2 hours 20 mins, plus an extra half hour to redo the neckline. As you can see, I’d calculated the neckband length wrong and it wasn’t lying flat, plus I didn’t like the lumpy top stitched finish with all those layers there. I needed an entirely new neckline, and way of sewing the band that wouldn’t be so bulky. I threw the dress over a chair in disgust and hoped it would magically fix itself, because I really couldn’t be bothered with it anymore. After a couple of weeks the answer came to me, and I hacked down the neckline using the Plantain shirt pattern piece, and then used the new-to-me binding technique detailed in Gertie Sews Vintage Casual. This results in the bulk of the layers lying within the neckband, rather than under the dress fabric, if that makes sense. I also topstitched in the ditch rather than into the dress fabric, which gave a much more pleasing finish. I’d say that’s a bargain, particularly as I’m planning to make it again and again! Has anyone else made the Heather dress? Or do you have a different favourite knit dress pattern? And are you as excited about Me Made May as I am?! Why yes, I am knock kneed. Thank you for noticing! That’s cute. When I first saw the pics I thought you were wearing a cropped cardi over a dress. I do like it and I like the strong colours. It is definitely better with the new neckline. 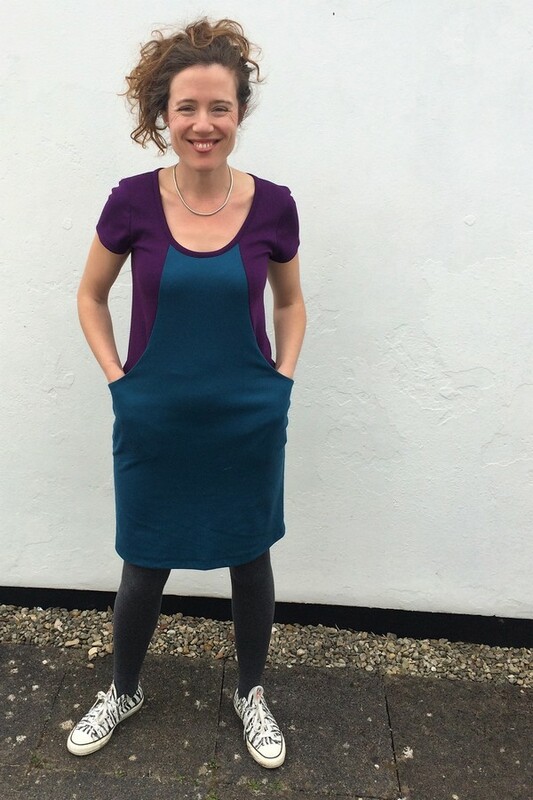 My favourite knit dress is a longer version of a princes seam top pattern. I just continue the curve for the hip and make it however many cm longer it needs to be knee length. I’ve drawn up paper patterns of it now as I’ve done it in a really wide and flowing skirt and a skinny version. Me Made May is an interesting idea. It doesn’t have to be just sewing does it? Hey Jill, good to hear from you! Me Made May was started by a sewist, but you can wear any me mades you like. The idea is to make your own pledge whatever you want to keep it fun and challenging for you. The idea is to improve your relationship with your me mades, and work out how to incorporate them into your everyday wardrobe more. I like the idea of extending a favourite top. I’ve just made one that would make an excellent maxi dress, so I’m planning to try that this month. With summer coming, I’m going to need more cool clothing! really like the colours and the neckline. Think you have done a good job. 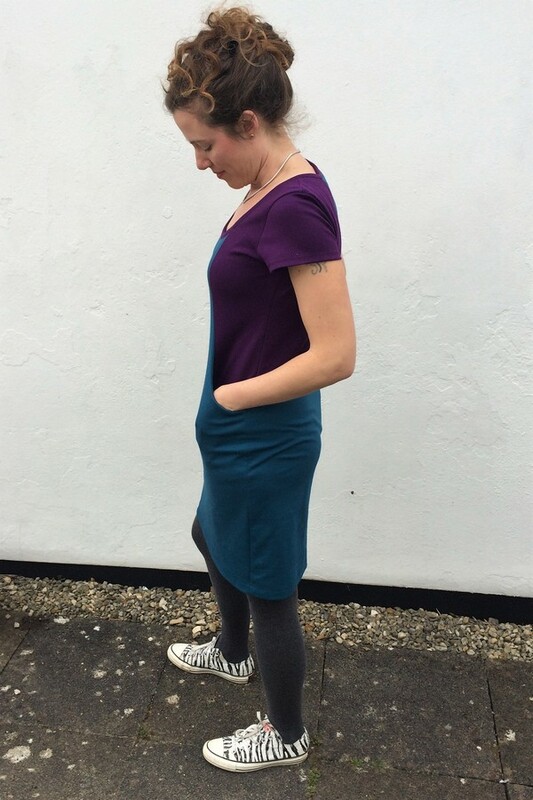 I’ve sewn a heather dress with long sleeves and found them very tight, I also used a looser double layered 3D jersey (not sure what the fabric term for it would be) which doesn’t work as well. 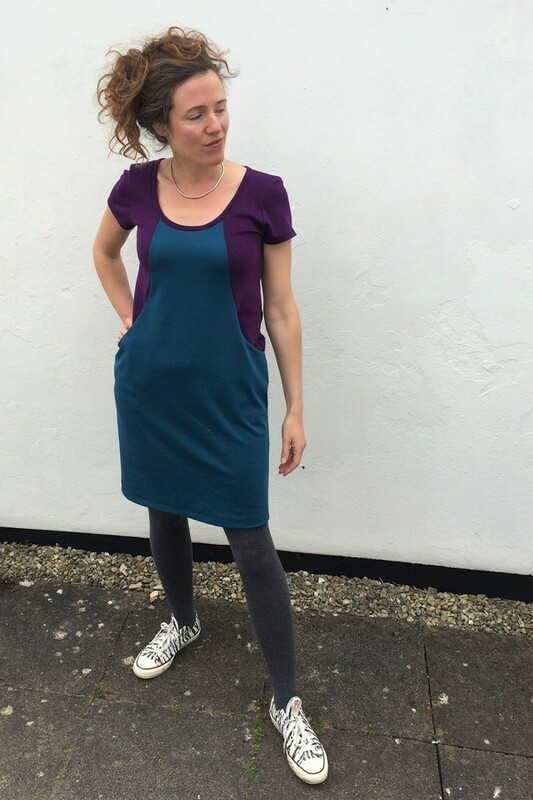 Must make a heather dress in the recommended fabric! Previous Previous post: Finding my style… and it’s not what I thought it would be!